132,000 square kilometers (50,965 square miles) per year. According to a recent study in Current Biology, that’s the average rate in the decline of the Earth’s wilderness areas in the last 25 years. Using data from maps dating back to the early 90s, an international research team discovered that about 3.3 million square km (1,274,137 square mi) of wilderness has been destroyed since 1993 as a result of human activity, such as mining, logging, and negligent infrastructure projects. Credits: James E.M. Watson, et al. The researchers defined wilderness to be areas that are “biologically and ecologically largely intact landscapes that are mostly free of human disturbance” — such as large-scale land conversion, industrial activity, or activities that create heightened levels of biophysical disturbance. “The amount of wilderness loss in just two decades is staggering and very saddening,” says one of the team, James Watson, from the University of Queensland in Australia and the Wildlife Conservation Society in New York. 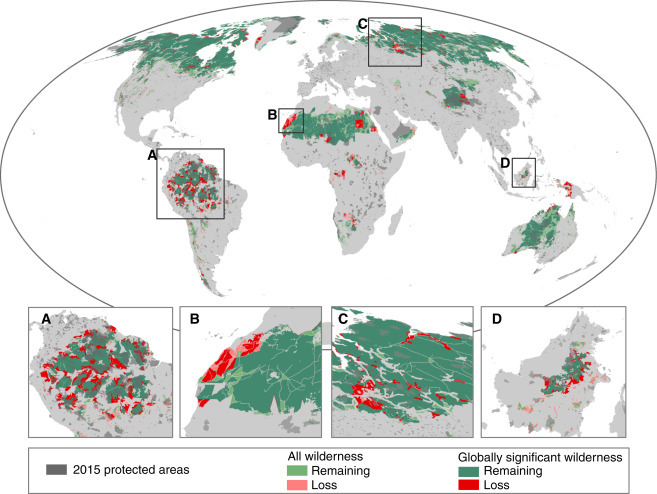 At present, wilderness areas amount to only 23% of the Earth’s total land mass. The largest areas that experienced decline in wilderness are the Amazon (nearly a third) and Central Africa (losing 14%). What is even more alarming, according to the researchers, is that the rate at which we are destroying wilderness areas is significantly faster than the rate we are establishing protected areas. “You cannot restore wilderness. Once it is gone, the ecological processes that underpin these ecosystems are gone, and it never comes back to the state it was,” explains researchers James E. M. Watson, of the University of Queensland in Australia and of New York’s Wildlife Conservation Society. In the same time period, the total number of new reserves created is just at 2.5 million square km (965,255 square mi). Persisting on the same path, without regard for the remaining wilderness areas or without improving preservation projects, will certainly lead to situations much more difficult to recover from. It’s time to start making some changes.